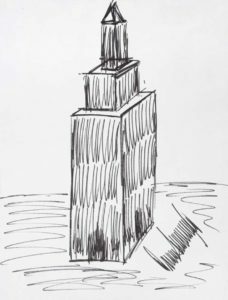 President Donald Trump has bought a sketch of the Empire State Building drawn by Trump for $16,000 at an auction. Elie Hirschfeld, president of Hirschfeld Properties, purchased the 12-by-9-inch black marker depiction of the iconic New York City skyscraper at an auction in California and online last week. It was created by Trump for a charity auction in Florida during the time he opened his Mar-a-Lago estate as a private club in 1995. Julien’s Auctions says the piece signed by Trump went for less than $100 the first time it was sold. This entry was posted in Elie Hirschfeld Art, Elie Hirschfeld News and tagged Donald Trump, Elie Hirschfeld, Trump Drawing on October 24, 2017 by admin.